It’s the most wonderful time of the year! The holidays are right around the corner. Festive parties, cozy nights around the fire, warm hot cocoa… we’re giddy just thinking about it. To officially start the holiday season, we’re releasing our three new holiday gift sets that are jammed packed with only the best in everything local for your gifting needs. Mugs, chocolate, scarves, candles, tea and more! Whether you’re buying for a friend, your boss, or yourself, we’ve got you covered. Lohtu, a Finnish word that encompasses a similar feeling as the Norwegian word hygge, was created to encourage a simple, easy life. Amanda Kelly, owner and potter of Lohtu, hand-throws all creations in Park Rapids, MN. Enjoy your mug on a cold winter night with tea, hot cocoa or mulled wine. in your new ceramic mug. Peep the steeping instructions on the bottom of your tin. M&P pro tip: Add a cinnamon stick to your tea to up the flavor. What's tea without a little honey? Made from local honey bees and packaged in St. Paul, MN, Bare Honey makes a delicious assortment of honeys, honeycomb, and honey sticks. We paired ours with a dipper for easy honey access and less mess. Nestled in the quaint Cathedral Hill neighborhood in St. Paul, Golden Fig is our go-to store for artisan foods. We love their assortment of spices, which are made fresh every week so you know you're getting the best quality. These cinnamon sticks add wonderful flavor to any drink or bake. What’s a Minny & Paul gift without a little treat? This season we partnered up with a bean-to-bar chocolate company in Fergus Falls, MN to bring you a delicious treat. Peep another flavor of theirs in our other holiday box. Those cold Minnesota winters are ahead and what better way to stay warm than a hand dyed wool scarf from our friends at The Scarf Shop. Great with any skin tone. Pop on some sugar lip scrub from Miss Violet Lace for soft exfoliation and shea butter finish. A necessity in the dry, winter air. Sold out before fall even begins in Minnesota, this Fraser Fir candle will put you in the ultimate holiday mood. A light pine scent poured into a beautiful copper votive, this candle a necessity this season. We thought ahead and paired your candle with matches from Illume. Stored in a lovely white canister, display them on your coffee table, nightstand or anywhere your frequently lighting candles. 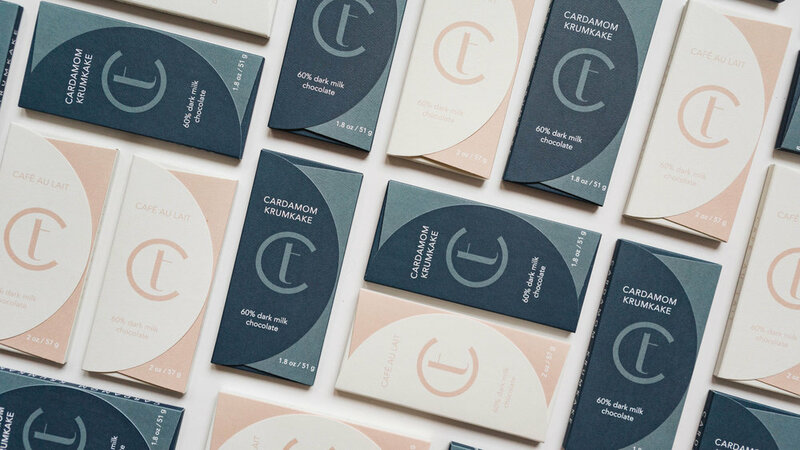 An organic coffee infused chocolate bar from Fergus Falls. The cutest mini chocolate bars from our friends Terroir - we are proud to feature their chocolate in all three holiday gift sets this season. Or want to see these gifts in person before you buy? Find us at the many pop-up events we’ll be at this holiday season on our event page. Planning your corporate gifts can seem overwhelming, time consuming and you may be asking yourself - “is it even worth it?” In this post, we’ll break down gifting into 4 simple questions that will not only help get you started, but also prove the ROI in gifting. Let’s jump in! Assessing what’s realistically in your budget is a great place to start. How much do you want to spend on your clients? Do you want to set a budget per gift or an “all-in”? It can be helpful to set tiers as well - i.e. allocate a larger budget for the premier clients and a moderate budget for smaller clients. This is the framework to start building your gifts. Make sure to consider things like shipping cost vs time for hand delivery. Even if you’re starting with a rough estimate, knowing what you’re working with can help us determine what types of products we can include in your proposal. Whether you want to send 30 gifts or 200 (12 is our minimum), we can accommodate all kinds of budgets and volumes at Minny & Paul. If you’re not certain how many gifts to send, compile a list of all of your clients in a spreadsheet. Since you are already taking the time to do this, you might as well gather their addresses during this stage. Categorize each client by impact on your business and their potential future relationship with your company. Prioritize the ones who are contributing to your success. Now that we’ve set your budget and quantity, it’s time to think about your theme. Deciding on what to feature in your gift set can seem daunting but it doesn’t have to be. Before you get set on a specific product, we reccomend determining a theme. Will you send all food? Mostly products? Go for a rustic vibe, feminine or monochromatic? After you’ve determine the look and feel, it’s time to choose the items we’ll feature inside your gift. We often refer clients to our online shop or corporate catalog to call out products they are drawn to. Once we know a few products you like, we can start to curate a proposal featuring those items and suggest others that will pair well. If you are the type that prefers to simply say - here’s our budget - you take the wheel! We love crafting projects from scratch and will curate options for you after getting to know the needs of your particular project. Typically, we can deliver gifts two weeks after contracts are signed.. Look ahead on your calendar - are there any important dates coming up when sending a gift would be appropriate? Client milestones? Birthdays? Holidays? Closings? If so, plan ahead knowing it may take a bit for your entire team to get on board and for us to curate and deliver unique and impactful gifts. Spending money on something other than internal necessities can feel nerve racking. But, when done right, the return on investment can be huge. 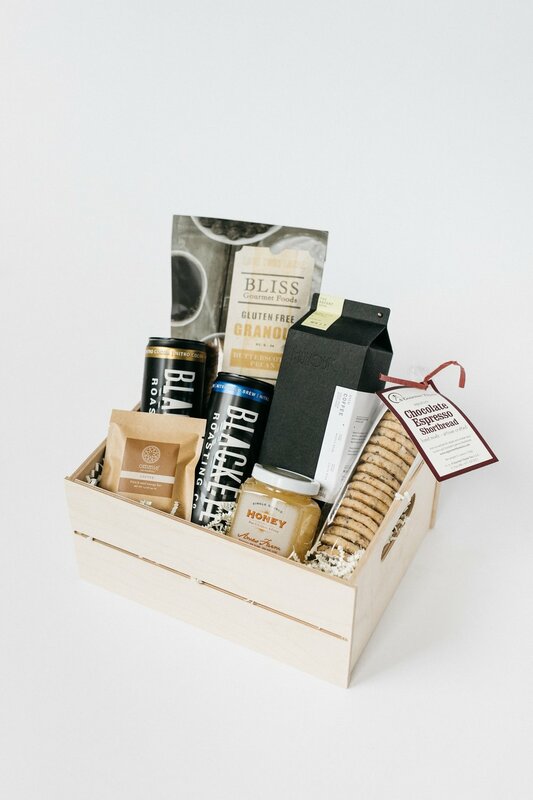 Delivering a memorable gift to your client can establish an emotional connection to that moment and help keep your company top of mind when they’re in need of your services in the future. Sending an unexpected dose of gratitude goes a long with your valued clients. 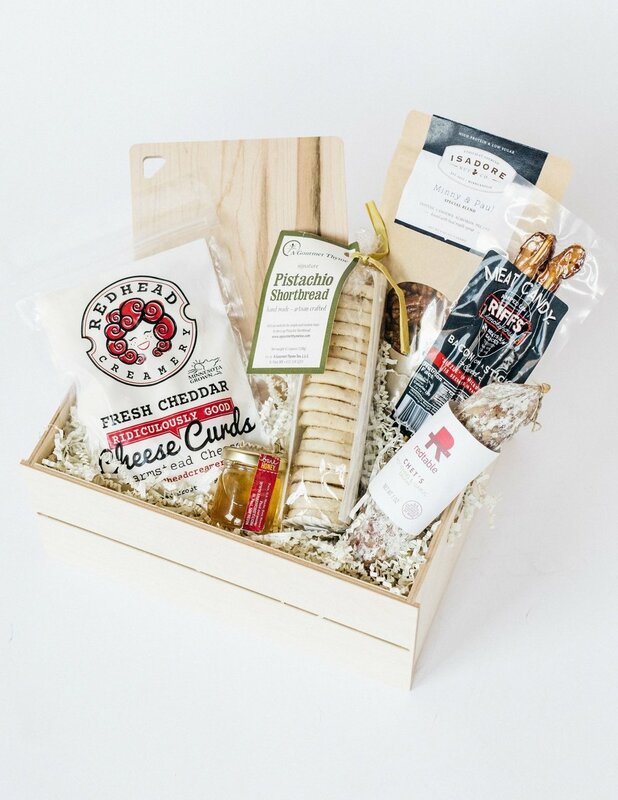 Sending gifts to your valued clients doesn’t have to be a challenging process. Ask yourself these questions up front, determining the best fit, and let us do the rest. Along the rolling bluffs of the Mississippi, you’ll find the village of Stockholm. Nestled within this tiny town (population of 66) are plenty of local artisan shops and good food which is enough to fill a full day with activities. Stockholm is similar to the Twin Cities in that they also have a bike-sharing program except the bikes are refurbished junkers, painted blue, and free for all to use! Voted Best Day Trip in 2017 by City Pages, this artfully authentic town does not dissapoint. Below are some of our favorite places and things to do! Homemade pies just like your grandma used to make. Whether you opt for a whole pie, just a slice, or one of their pie cookies, you’ll be addicted. They also make Gluten-Free Pie and it's honestly incredible, you will need to call 24 hours in advance but they can make it happen! If you are traveling to the Pizza Farm, we recommend placing an order so that you can pick up dessert on your way! The Pizza Farm has developed quite a following over the past few years for their farm-fresh wood-fired pizzas that can be eaten right on the farm. It is important to note that it is only open on Tuesdays and the wait can get up to over an hour. We recommend bringing salads, snacks, lawn games, and all of your usual picnic supplies as the Pizza Farm is a Pack it In/ Pack it Out establishment. Long wait times start to occur after 6 pm so plan accordingly! Generally, July is the most consistent month for picking. It is suggested that one calls ahead to find out what is ripe. More than just blueberries! When you arrive, the owners will equip you with everything you'll need and then direct you to eat your way down the blueberry patch, so that you can try different varieties, and pick your way back- yum! Good Turn Farm grows certified organic vegetables, cut flowers, berries, and mushrooms. It's a family tradition to have a pesto-making party every summer and Good Turn Farm lets us buy basil by the pound! This year we made enough pesto sauce for over 50 pounds of pasta! Last but not least, any opportunity to spend time on the river or hiking in the bluffs should be taken advantage of. The constant breezes on the lake and scenic landscape makes Lake Pepin a favorite for sailing and steamboats - cruises available for both. The Mississippi River and many tributary streams and rivers foster great spots for canoes, kayaks, and small power boats. Maiden Rock Bluff Natural Area just outside of Stockholm and Frontenac State Park across the Lake from Stockholm both provide great views of the lake and an assortment of Raptors.